In June 2009, Classic Glass was approached by a customer who had a magnificent welded iron billiard lamp measuring approximately 48″ x 18″ for his home in West Virginia. The customer was looking for an exceptional piece that would compliment the lamp’s iron work and fit with his home’s outdoor/nature theme. “This is the kind of job that is right up our alley so we jumped at the opportunity to create this truly one of a kind piece,” said Karen Elkin, President of Classic Glass. To get started, our resident stained glass artist Rudi Waros selected the glass that would bring the piece to life. Rudi traveled to Youghiogheny Glass(pronounced YOK-a-GAY-NEE), a materials supplier in Connelsville, PA, known for their nature-themed opalescent glass. At Youghiogheny Rudi browsed an extensive collection to hand select sheets of “stipple” glass. “I was looking for glass that would be appropriate to the outdoors theme, something that really came to life when the lamp was lit up” Rudi explained. Unlike traditional opalescent glass, Stipple Glass has an icy or waxy translucence. This translucent color works well with bright light sources, evenly diffusing the light giving a three dimensional effect. As in the original Tiffany glass, Stipple Glass has some light mottling and surface haze. The overall effect of Stipple Glass is unlike any other glass on the market today. Back at the shop Rudi hand cut pieces of the selected glass and used a copper foil technique to create four panels that were then siliconed into place. 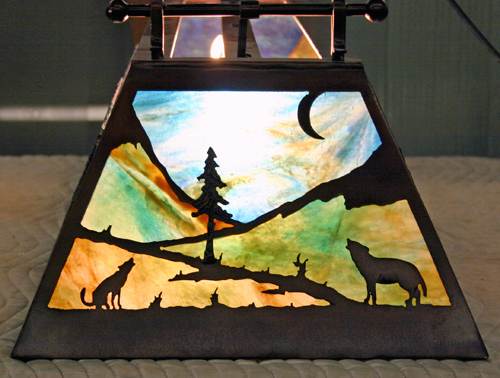 The result is a unique piece of decorative glass art reminiscent of a watercolor painting. This entry was posted on Tuesday, July 7th, 2009 at 1:51 pm	and is filed under Decorative Glass. You can follow any responses to this entry through the RSS 2.0 feed.Both comments and pings are currently closed.